Their work will be no more appreciated, though, and this time Dyke will be turning his throat-slitting gesture away from himself and towards the heavens. Indeed, the draw was seen as too straightforward by FA representatives in Nice, who sat stone-faced as images of empty Wembley seats set alarm bells ringing. Their fear is that the clashes thrown up, against the likes of San Marino and Estonia, will not be enticing enough to fill the £757m stadium, on which £277m is still owed. 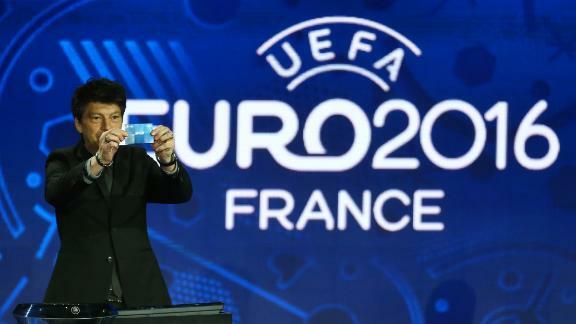 If the concern pre-draw had been ‘go easy on us this time’, the sentiment afterwards was no doubt: ‘not that easy’. Amidst the panic, plans to pull in more glamorous opposition for the friendly windows have been hinted at. But Roy Hodgson is not likely to appreciate such interference as he struggles to prepare his squad for two major tournaments. International football is already so marginalised that managers complain of insufficient opportunity to work with their squads. Now Hodgson faces a situation where the little time he is afforded will be used not in the best interest of his team, but of the FA. They will be unwilling to let him play friendlies against lesser names, and even more reluctant to play these games away from Wembley, denying the obvious advantages of gaining experience on foreign soil. Footballing concerns submit to commercial concerns. It is a sentence that feels like a broken record in this modern football paradigm. But New Wembley is very much a part of this paradigm and the FA’s reactions will come as no surprise. As soon as plans were drawn out for the new national stadium, dollar signs became the priority for a business model built upon the lucrative sale of 10-year debenture seats to the corporate elite. Such greed has sucked the life out of the FA Cup, whose semi-finals must now also be played at Wembley, at times which suit TV companies rather than fans, and with ticket allocations that see the champagne quaffers as equally represented as either set of supporters. It almost feels silly to bring up such complaints, so depressingly familiar have they become and so resigned and powerless many of us now feel. Maybe the Gods have had enough, too, and maybe they used San Marino, Estonia, Lithuania and Slovenia to give Dyke and his associates a taste of the despair they themselves inflict on such a number of football supporters. As long as the FA remains focused on finance rather than football, may the Gods continue to wreak their fury. This entry was posted in Analysis and opinion and tagged england, euro 2016, FA, greg dyke, san marino, wembley by The False Nine. Bookmark the permalink.